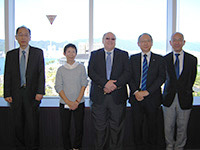 On November 2nd, Dean Bricker of the Duquesne University School of Pharmacy and the pharamaceutical sciences faculty at the Kobe-Gakuin School of Pharmacy conducted a signing ceremony at the Port Island campus for the renewal of the exchange agreement between the two universities. 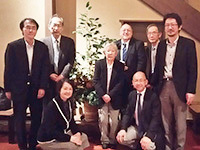 The signing ceremony was attended by the Overseas Exchange Committee of the Faculty of Pharmacy, including Professor Masami Sato and Professor Yasuyasu Yamazaki, Professor Yuko Yamazaki, Professor Yuko Tsuda, director of the International Exchange Center, and Professor Shirokawa Shirakawa. 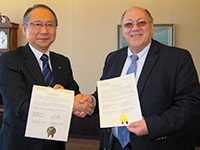 The Duquesne University and Kobe-Gakuin University Schools of Pharmacy have exchanged teachers and students for 25 years since establishing an exchange agreement in 1991. The exchange agreement has been renewed every five years. 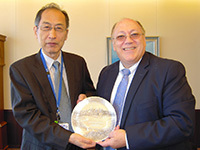 This marked the fifth renewal of the agreement. Duquesne students who travel to Japan will learn about Asian medicine and tour nearby medical facilities.